We at Trippi’s Uniforms Inc. strive to be the most reliable source for brand-name uniform clothing and equipment. We provide our customers with the best products, knowledge, and service in the industry. We stand behind everything we offer with a 100% satisfaction guarantee. If the customer is not satisfied with their purchase, we are not satisfied. Our highly experienced staff takes pride in working with everyone in the civil service industry as well as the medical and culinary fields. Don’t just take our word for it----give us a try and you will see for yourself. In 1921 Antonio Trippi moved from New York, NY to Worcester, MA and established the Worcester Pants Co. His factory produced clothing for men, women, and children and began a long tradition of offering the highest quality products available. As a boy, Frank Trippi began working in the factory with his father and through the years absorbed every aspect of the business. In 1945, Frank, now nicknamed the “Pants King”, took over the factory and began plans for expansion. 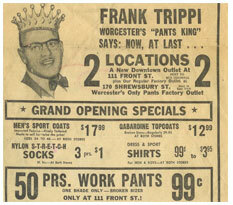 By 1955, Frank Trippi’s was the only clothing factory outlet in Worcester with two locations and many satisfied customers. In the early 1970s, Frank paved the way for his sons, Michael and Anthony, to carry the torch and open Trippi’s Regular, Big and Tall Men’s Clothing. As a retail store now located in Shrewsbury MA, Trippi’s offered a huge selection of casual and formal wear in regular, big and tall sizes, as well as the continued tradition of “Free Alterations While You Wait”. In the early 1990s, the local demand for police, fire, and postal uniforms grew rapidly. Michael and Anthony realized there was a need for a uniform clothing and equipment store in the area and decided to open Trippi’s Uniforms Inc. Today the family run business continues to provide the same high quality products and unparalleled service that Antonio did back in 1921. Fourth generation cousins Nicholas, Marcie, Frank and Anthony Jr. have recently taken over the reigns and look forward to bringing Trippi’s Uniforms Inc. into and beyond its 100 year anniversary.